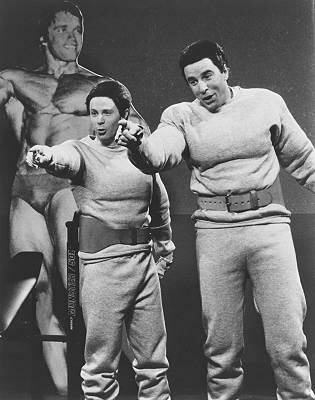 We're going to PUMP...YOU UP!! I have to admit, I am probably in worse shape than a dodecahedron. All I know about staying in shape is what I learned in my Grade 10 Geometry class. All I know about being fit is what I learned from my tailor. So you can imagine my delight when I was contacted by Fit and Busy Dad, a fitness expert, personal trainer and fellow dad blogger (he is a father of four), with an offer to join the Dad Jam and share his fitness expertise with us. We decided to run a series called “Muscle Mondays,” which will be a five-part series addressing what busy dads can do to get back in shape. Today is our first Muscle Monday installment. Getting Busy Dads Back In Shape: 5 Strategies To Get Rid of the “I don’t have time excuse”…Well, 4 strategies and Bonus actually. I was at my daughter’s soccer game one day and I heard this question being asked by someone behind me. Initially I didn’t turn around, then after a swift elbow nudge from my wife I realized that it was being directed to me. One of the fellow dads sitting in his lawn chair, diet Coke in hand, was looking my way smiling. In past days I would have told him that I was a personal trainer and that it was a job requirement to stay in great shape. These days, I usually avoid that answer because that question is always the precursor to the infamous question, “Can you please tell me how to get rid of THIS.” (Click HERE to find out what I mean). So instead, I said, “I just make a commitment to exercise and make time for it”. Sound familiar? It did to me. Not because people seem compelled to come to me and tell why they’re not in shape and give me excuses why they can’t exercise, but because I used to say those same things. It’s no doubt that Fatherhood is challenging and the transition from being a single dude and only having to worry about yourself to being THE ROCK of the family and taking care of 1, 2, 3, 4 or (in my case) 5 others is a HUGE adjustment and a big awakening. Couple those new responsibilities with existing work and financial commitments and it’s no wonder that your health/weight/diet/active lifestyle takes a hit. We got deeper into the conversation and I told him that I’ve got 3 other little ones (I’m sure he’s seen them before because we’re at every game). I’ve got a business to run. I share the daily chores with my wife. And I make spending quality time with my family a priority. My wife and I do all this, just like many of you, with no nanny or “help” (which seems to be a common thing in the city I live in). It’s a struggle everyday to find the time to stay in shape. I’ve gone through weeks, and months even, of not doing any physical activity. But since I’ve turned 30, and witnessed my 59-year-old (non-overweight, former athlete, exercising, married-to-my-dietician-mother) father suffer from a heart attack (on his 60th birthday) and a quadruple bi-pass just 8 months ago, I made exercise a priority in my and family’s life. Sure there are days when I don’t want to get up for that 6am client. Sure there are days when exercise is the last thing that I want to do. But I do it. A friend of mine once said, “that successful people are willing to do what unsuccessful people won’t.” (If you know who said that originally, then let me know because I know it wasn’t my buddy). It’s true. If you can get up just 20 to 30 minutes earlier in the morning, it will make a world of difference in your life. Be it exercise, writing, reading the morning paper or just getting an early start on the day, waking early is how productive and successful people get things done long before the rest of the world gets going. Be like the ARMY, do more by 6am than most people do in the entire day. It’s incredibly empowering and you will have an overwhelming sense of accomplishment if you can cross more things off your daily “to do” list before the wife and kids wake up. I get excited to wake up in the morning now because I know that I’ll have that time to myself that I rarely ever get. Hitting that snooze button 2 or 3 times to get that extra 20 or 30 minutes of sleep is enticing. But will it make a positive difference in your efforts to get back in shape? Not if you know your day is packed and you’ve got that “I’ll get around to it” mentality. Just get up and get it done. You’ll feel better for not putting it off. There is a misconception out there that you possibly can’t get a decent workout in less than an hour. In the second part of this series, we’ll discuss that myth. For now, go set your alarm clock ahead 20 minutes and reap the benefits of being more productive. Chris Lopez is a fitness expert, writer and personal trainer. He is an occasional contributor to the Globe and Mail, Maximum Fitness and Men’s Fitness Magazines and has been helping get Busy Dads in shape for 10 years since the birth of his first child. He and his wife Rozanne live in Toronto, Canada with their 4 daughters. Sign-up for your free report & workout at www.FitAndBusyDad.com or visit Chris’ blog at FitAndBusyDad.blogspot.com. Thanks Chris for joining the Jam and sharing this advice with us. Stay tuned for Part 2 of 5, coming up on our next Muscle Monday!